Laura that skirt is FAB.U.LOUS (said in my best Craig Revell-Horwood voice), I love the colours. Glad to hear your partner's son is coming home. I like the idea of 'Awards' - something to aim for. I've just spent a further 16 coupons - a pair of black trousers, essential for work and I couldn't find anything suitable second hand, and a multipack of M&S undies. I have been talking about making my own knickers for at least a year, and still not got round to it. Maybe I'll sacrifice one of the old pairs (my fingers went through the side seam - they are very old!) as a pattern. It doesn't take long to get through those coupons, does it. Finished my latest pair of ankle-socks with yarn bought with the recent coupon-spend... and guess who's back to the dentist for another series of appts, argh, no, the knitting shop, and I thought I was safe til November! Anyway, I'm trying to get a basic me-sock pattern sorted, using the same needle-size and yarn-weight and stitch-count, etc., each time, so that even if my eyes deteriorate considerably I can still knit socks. These are a good start on the Standard Sock pattern! I have been gifted a pdf pattern for a Forager vest. I shall print that later and start sitting through my fabric to see if I can make it from my stash. Last edited by CAFCGirl; 12-04-2019 at 4:50 PM. I usually upload to Pinterest but I will try Ravelry. This is a bad photo of it, and I'm wearing my cleaning clothes with it. CAFCGirl, regardless of what you're wearing, the shrug looks lovely. Wear it with pride. I have been gifted a pdf pattern for a Forever vest. Have a lovely day on Monday. What is a "Forever Vest"? When I Googled the term, it came up with a hunting gilet. Pity about the dentist. Do we need to arrange to have you barred from the yarn shop? First - a big hug to you. Second, please excuse me while I dust off the nurse's hat that's been breeding dust bunnies in a corner for the last 25 years... (Yes, I was a nurse when I left Oz.) You can slap me, if I'm providing too much detail. You're dealing with two, totally separate problems. Astigmatism is where the cornea - the front of the eye - isn't completely spherical. For some reason, there's a flattening in one part. The variation is usually minuscule, but the effect means that your distance vision will be a bit fuzzy around the edges. You may have lived with an astigmatism for years and just assumed it was your short sight worsening. Astigmata change over time and may even improve. (Apparently my left eye's improved between my last pair of glasses and these latest ones.) Surgeons can correct it using the same laser surgery techniques that are used to correct short sight, but rarely is it bad enough to justify on its own. These days, you can get specially weighted, soft contact lenses to correct it, if you don't want to wear glasses. The lens is removed and replaced with a perspex one, usually with miraculous results as far as the patient is concerned, since they'll also correct short/long sight at the same time, if they can. For example, following cataract removal in his late 60's, my severely short-sighted dad suddenly didn't have to wear glasses for the first time in his adult life and, from our local beach, could see the mountains on the far side of Port Phillip Bay (something he couldn't recall seeing before). Those socks are great. I see you do a "French heel" like I do (Sl1 K1 on the knitted rows). If it's any help, this is my standard sock recipe for 4-ply yarn on 2.5mm needles. If I need to increase the size, I'll do it it in 4 stitch increments. Me (UK size 5): CO 60st DH (UK size 11): CO 72st. Divide between 4 needles - I do 10st, 20st, 20st, and 10st - then join in round being careful not to twist. Work K2 P2 rib for 15 rows. Change to stocking stitch and continue knitting until 68 rnds (Me) or 72 rnds (DH) are completed. In the meantime, use a plastic coil needle holder to keep needles 2 and 3 out of the way (and to stop those stitches slipping off). Start after you have completed an even numbered (Knit) row. Slip1 purl until you are 2 stitches after your centre marker, p2 tog p1 turn. Slip 1, k until you are 2 stitches after your centre marker, SSK, K1 turn. Slip 1, P until you are 3 stitches after your centre marker p2 tog p1 turn. Slip 1, k until you are 3 stitches after your centre marker, SSK, K1 turn. Repeat these two rows, taking in one more stitch each time you go beyond the central marker, until you've incorporated all the stitches from your heel flap, ending with a knit row. Gusset: Using a latch hook, pick up 16 st (me) 37 st (DH) from the left edge of the heel flap and slip onto a separate DPN. Place a marker (M1) on your DPN (I transfer my row counter to this point) then knit 5 stitches from needle 2. Taking a fresh DPN, finish knitting the stitches on needle 2 and knit all but 5 of the stitches on needle 3. (You should have one DPN spare now or 2 if it was a pack of 6.) With your last, spare DPN, knit across the remaining 5 stitches from needle 3, place a marker (M2) and then pick up the same number of stitches that you picked up from the other side of the flap. Knit across the stitches along the bottom of the flap, then back up the other side to M1. NOTE: when knitting into picked up stitches, knit through the back of the loop, to make them twist, to get a tighter stitch and thus limit holes. Work the gusset in two-round increments: Rnd 1, knit. Rnd 2 K to M2, slip the marker, k1, SSK. K to 3 stitches before M1, K2tog, K1. Continue decreasing in this fashion until you are back to the same number of stitches as your original cast on. When working with 5 needles gets a bit too fiddly, redistribute your knitting from 4 needles back to 3. Keep M1 in position, but you can lose M2 at this point. Work 48 rnds (me) 52 (DH). Needle 1 is the one with the marker. Rnd 1: K to 3 st before the end of needle 2, K2tog, K1. Start needle 3, K1 SSK, k to 3st before your marker, K2tog, K1. Rnd 2: Slip marker K1 SSK. K until you're back at the marker. Cast on the second sock and knit to match. ETA: Stitch gauge is 7 stitches to the inch. Last edited by PipneyJane; 19-04-2019 at 1:20 PM. Silly autocorrect on my Kindle.
" Do you have a shopping list on your phone of yarn that you actually need? If not yarn, then needles?" So, well, "need"? this is like having a list of chocolate that I actually need, isn't it? No astigmatism anywhere in the family - short-sightedness in Dad, caused by the kerataconus (he had 20/20 vision til it developed in his early 30s) - and the only cataracts anywhere in the family are Dad, again linked to the kerataconus and only arriving very mildly in his very late 70s. So it isn't hereditary - even my parents' grandparents didn't wear glasses and some of them lived to older old-age. Mind you, I have psoriasis which also doesn't run in the family so I am a genetic freak in that way already...! My eyesight is already poor enough that I've never been suitable for laser surgery - they could improve it but I would still need specs even just for moving around at home, the whole time. Not much point going from strong perma-specs to medium perma-specs! Your sock-pattern sounds a lot like mine - it's sl1-p1 on the wrong side, btw, on the heels, because I hate purling and it halves the number I have to do I use 2.25s with 4-ply as I like the denser result and it's much much harder-wearing. So I c/on 72 but on the 2.25s that works out to my size-6.5 nicely. C/on 72 on 4mm and change to 2.25s. Knit 2/2 rib for 18 Rs. On R18, use last 18 and first 18 for heel, for 36 rows, sl first and alt purls. Turn at 15 left, and k1/p1 after (22). P/up 19 (11+19=30) and decr on 2nd and alt rounds. Arrange 18-36-18 and decr -4, knit 3 Rs, decr -4, knit 3Rs, decr -4, knit 3rs, decr -4 (four decr in all - pso/k2tog, both times). Then decr -4 every round until 8-16-8.
ie whatever you did last time, change it. Never two ons or offs in a row. One of the things I find really fascinating about knitting is how many different ways there are to arrive at pretty much the same result! I can't use circs, for example, because I can only knit with the RH needle anchored in a knitting-belt, or more usually just stuck into my waist area... but others can't use DPNs... and the range of different ways of doing thigns, firmly preferred by each knitter. It's worse than apple pie recipes! I've been reviewing my leggings collection, the cotton ones I cut off short and edge with crocheted lace to wear in summer under skirts, and I fear the patches need patches on the patches! So I think i shall invest in a couple of new pairs next time I pass Primark. I have 33.5 coupons left, so part of me is saying I shouldn't spend any more til six months of the year are past - but of course, that's not how to think, is it? I need to think of what I actually *need* to buy. It's not like last month's coupons are snatched back on the 1st! How many stitches to the inch do you get? I'm curious. I get 7 on my 2.5mm's. Tension is such a personal thing; we may be making the same tension while using two different needle sizes. I was taught to knit by my grade 2 school teacher, in 1973, just before my 8th birthday. Everyone was taught, boys and girls. We learned "English style", i.e. holding the yarn in your right hand and holding the right needle from above, then my mum taught me "Australian style, where you tuck your thumb under the right needle, supporting its weight. The remainder of the hold and the knitting action is the same, but the Australian style means that you aren't dropping the needle to make a stitch, so makes it faster and more secure (you don't have to clamp the right needle into your armpit or waist to form a stitch or worse, hold the two needle tips with your left hand while you wrap the yarn with your right). Using a latch hook also came from mum, they're much more secure when used to pick up a dropped stitch than a crochet hook and you can force them through the tightest stitch in order to pick up yarn. Mine are designed for the bed of a knitting machine; I blagged half a dozen from a vendor at the Knit-and-Stitch Show a few years ago. My grafting is pretty much the same as yours. I just ran out of time to describe it. I learned to knit socks in 2006 from a kit I purchased after years of reading the Yarn Harlot rabbit on about knitting socks: one set Addi 8" dpns, 2 stitch markers, 100g of Opal sock yarn and a photocopied handout, that I think also came from Opal. (If you can read German, I think they used to print their sock pattern on their ball bands.) I've knitted so many pairs of socks now that I've just internalised that pattern, with a few modifications (the French heel, picking up an extra stitch in the "corner" of the gusset, twisting the first row of stitches). One of the things I find really fascinating about knitting is how many different ways there are to arrive at pretty much the same result! I can't use circs, for example, because I can only knit with the RH needle anchored in a knitting-belt, or more usually just stuck into my waist area... but others can't use DPNs... and the range of different ways of doing things, firmly preferred by each knitter. It is indeed! I used 12" long DPN's to knit the collar of my first jumper, when I was 10, and hated them; too many points, in too many directions, all getting in the way AND stitches slipping off. (I don't remember when I got my first circular needle, but I probably would never have finished the collar of another jumper without one.) When I got the sock kit with 8" DPN's, I dreaded using them but discovered that shorter DPN's are much less intrusive - I didn't get spiked once - and my preference is now for 6" ones. Another 2 yarn cakes from the most positively retro haberdashery type place - wool focused but also selling insoles, gift wrap by the sheet, insoles, thermals and exercise books - like what I remember post offices used to sell. Was quaint and compact on space, floor to ceiling. The yarn is definitely my colourway, greens, blues, mauve purple blue. I haven't a clue what I'll do with it though..... It was just too good a bargain to pass up. I was then also gifted from my mum 7 balls of yarn she got as a blanket set but isn't likely to use. So that's added to the stash. I'm off to hers today to demonstrate loom knitting. I might crack out a hat to show her which can then be donated on in the autumn to the homeless charities. I'm pleased the weather seems to be improving so I can start wearing my linen dungarees again..... They don't really work in cold weather unfortunately. Last edited by CAFCGirl; 16-04-2019 at 1:54 PM. Checking three different pairs, I seem to knit to around 9.5 to 11 stitches per inch, depending on the yarn, and sometimes I use 2mm if I've not got four 2.25s - much tighter than most sock patterns suggest! Maybe it's my tighter tension but I don't recall the last time I dropped a stitch or lost one in transit - I don't have to hold the RH needle at all, so I just have one hand doing one thing, left moving the needle and right moving the yarn, and the movement comes from the shoulder so doesn't lead to RSI and if it's straight stocking-stitch then it's a handy 55-60 stitches per minute, slower of course on ribbing or shaping or whatever. It's whatever works best - like love or the kitchen clock, as they say! I'm pleased to have saved the coupons, though! And a real eye-opener for me not to get complacent, as I would have sworn I didn't have bought-but-unworn clothes in this tiny flat! 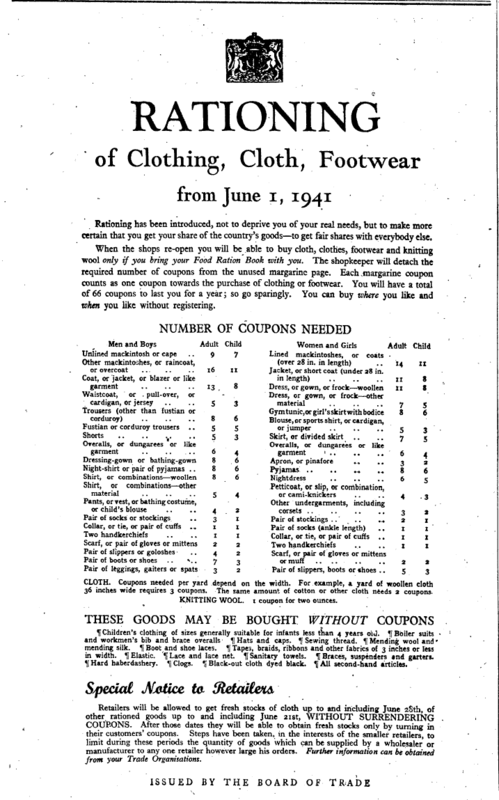 I have just discovered this thread and it sounds a fun way of controlling my expenditure on clothing, also, as a avid reader of WWII novels I think it would be fascinating to try to experience some of the difficulties they faced. As it is April I have added up the coupons I have used so far and I taken them from the 66 coupons allowance therefore have 44 coupons left for the rest of the year. Oh, it is great fun! Instead of which we have the coupon system to save arguments, we have some very inspiring women before us whose situation compared to our luxury really helps encourage us to think more, and we have a cheerful group who work by being friendly and nice and positive about the challenge! Coo, ain't we the lucky ones?! Also - I am buying some lurex thread to add to yarn I already have, to knit a doubt-excluder* for a friend starting a new, scary but good chapter in her life in her 50s... but lurex doesn't count as yarn, does it? I mean... it's thread... isn't it? I have to confess that I'm fascinated by the social history aspect of WW2: how people lived; what they cooked; growing your own veg; the clothes, etc. I loved reading Simon Garfield's books, We Are At War, etc, which used Mass Observation diariy entries from the period. Laura, sounds lovely. A hug in a scarf. It meant I could go in and wallow, without feeling bad that I didn't buy anything - she seemed happy with the idea! I really love the idea of a 'doubt excluder', what a great gift! I am inspired by all the knitting talk. I would love to knit 'Continental Style', which I think is what you are describing, Laura - I do know someone who learned to do this but I think I would find it very hard to change now, it is much faster than 'traditional' knitting I believe. I have had to think about what I do, because it's instinctive - I hold the left needle in my left hand, and I somehow grasp the right needle in my right hand and manipulate the wool with my fingers ... I couldn't really describe it, I don't let go of the needles at any point and I knit quite fast, but I'm not sure if it's a proper technique! I knitted my first pair of socks about three years ago after getting a book on sock knitting for Christmas, I was thrilled with them and then for some reason since then every time I have tried it has come out too big, too small or too floppy and I've given up. I might have another go following the notes from Laura and Pip above. All the talk of wartime books has made me revisit my favourite, Nella Last's War (the basis for the wonderful Victoria Wood film 'Housewife, 49'). She could sew, and even had an electric sewing machine and at the start of the war she is making cot blankets out of what she calls 'tailor's pieces' - scrap fabric, I assume. I started re-reading it this morning and had to stop or I would have got nothing else done! I have to declare another 2 coupons gone on underwear - which takes me down to 52 now, which still seems comfortable given how much I already own. I notice by the way (not completely incidentally) that sanitary towels were not rationed. Laura describes an older British style, not Continental but something that existed in areas where women knitted for a living, while they were doing other jobs. They’d wear a “knitting belt”, into which their needles were jammed, frequently using one hand to do their day job - herd goats or whatever - while using the other to knit as they walked. In Continental knitting, you hold the yarn in your left hand, similar to the way you would when you crochet. I’d did a quick search of YouTube and this was the most popular video teaching Continental Knitting. Again, however, there are plenty of variants. My friend, Kate, is Ukrainian and, while she holds the yarn in her left hand, her technique involves picking at the yarn with her right needle, regardless of whether she’s knitting or purling. She moves the needle round the yarn not the yarn round the needle, and is very fast. Dare I mention the dreaded T-word? You really have to match the tension specified in the pattern (at least the stitches per inch), even if that means starting over a couple of times, with different sized needles. Until you’ve found your “forever pattern” formula, I’d knit the cuff and then an inch or two of my first sock, then count my stitches per inch. If it doesn’t match the gauge specified by the pattern’s author, rip it out and start again. You will have only wasted a couple of hours, at that point. New undies were always a present at Easter - my parents both grew up with the custom.... I've asked friends over the years and only a few had the same tradition, but apparently it's a remnant of an ancient tradition of people renewing their baptismal vows at Easter, which involved wearing a linen shift - so possibly people associated new body-linen with this season, and by the 1970s it had turned into new knickers for a little girl! A good point re sanitary towels - one of those barely-mentioned things there are many myths about, but I suspect in the war a lot of women made their own and just managed. I know the disposable sort weren't around (at all? or just commonly?) til well after the war, much like disposable nappies weren't - but I think a lot of women probably bought pads made by someone else out of ideal fabrics and fillings, but during wartime had to make their own from whatever was available. I feel so brainwashed! But still, society does pile on the pressure, that really periods should be invisible, unsmellable, unmentionable and ideally just non-existent in some convenient way.